Shipping is automatically calculated prior to submitting your payment information. Simply add items to your cart and proceed to the Checkout page where you will be offered Shipping Method choices and their prices. Prices start from £14.95 for orders between £99 and £299.99. Orders over £300 have FREE DELIVERY, please note certain areas may incur additional delivery surcharges, such as areas of Scotland, The Highlands and other remote areas. Please note that we can only ship to mainland addresses with the exception of some island such as the Isle of Wight, please contact us for further details. There is NO DELIVERY CHARGE if you select the IN-STORE PICKUP option on checkout. However, you then need to arrange to come to one of our showrooms to pick up the order in person by completing the Order Comments or contacting us separately. Please remember to bring along the credit/debit card you used to pay for your order together with some form of identification. Due to the explosive content of fireworks, our courier charges cost us more than ordinary deliveries, therefore, in an effort to keep your costs down, we subsidise our customers’ delivery costs. Our standard three day service costs us on average £45.00 to £60.00 per consignment and this does not include the packaging costs incurred by us. A signature is required for all consignments. We recommend you use a delivery address where you know someone will be available to take receipt of your order, therefore avoiding additional re-delivery charges. It is a legal requirement that it should be someone over the age of 18 years, as proof of identity may be needed. Delivery is usually made Monday to Friday during normal working hours. If the courier attempts delivery and no-one is available to take receipt of your order you will incur additional re-delivery charges. We will typically call you or send an email to confirm your order has been dispatched and advise on delivery, plus requesting a safe place if you will not be in. Our standard delivery is usually within three working days of dispatch, and can be up to five days to Scotland and remote areas of Wales or Cornwall. Next day delivery service maybe available, so please contact us. How do I change quantities/cancel my order? During peak season orders are dispatched daily, to alter or cancel an order we would recommend calling one of our helpful staff on 01206 762123 with your order reference as soon as possible, so we can make the changes prior to our courier’s arrival. Once orders have left we will be unable to alter any order, cancellation may be subject to a cancellation fee if already dispatched. For updates on your order please contact the office on 01206 762123 with your order reference and we will be happy to contact our courier for an order update. Please contact us on 01206 762123 and we can check whether your order has been delivered or delayed. All orders require a signature on delivery, should you have not received your order it may have been left with a neighbour, please contact us so we can check with the courier for further information. Claims for shortages must be made in writing within three days of receipt of your order by post or email sales@dynamicfireworks.co.uk detailing what is missing and your consignment number. We can then contact the couriers for the location of the missing item. In the event the item cannot be found we will either send a replacement or arrange a credit. Claims for wrong products must be made in writing within three days of receipt of your order by post or email sales@dynamicfireworks.co.uk detailing what is missing and your consignment number. In some cases an item may have been substituted due to items being faulty or out of stock, in such cases the replacement item will be of equal or greater value. One of my fireworks is damaged? In the event of one of our products being delivered to you damaged please take photographs, and please notify us immediately on 01206 762123 or via email at: sales@dynamicfireworks.co.uk so we can arrange a replacement and collection of the damaged goods or a refund. We do not offer a sale or return policy. If an item is damaged or faulty please take photographs, and please notify us immediately on 01206 762123 or via email at: sales@dynamicfireworks.co.uk so we can arrange a replacement and collection of the damaged goods or a refund. No consequential losses arising out of the use of any products will be accepted. Prices are correct at time of going to press but are subject to change without prior notification. All firing times quoted are approximate. When the Consumer Protection (Distance Selling) Regulations 2000 apply Dynamic Fireworks Ltd will accept cancellation of an order provided that the customer confirms in writing to the address on this website within seven days of receipt of the goods. Upon receipt of such cancellation Dynamic Fireworks will notify the customer of the procedure for collection of the goods. Unfortunately we are unable to deliver outside of mainland Britain, delivery to the Isle of Wight and selective other islands maybe available. Please contact us for more details. 2) Enter your email address and password. What does the category of Firework mean? There are four divisions which fireworks fall under, which relates to type of item, level of hazard, net explosive content and noise level. 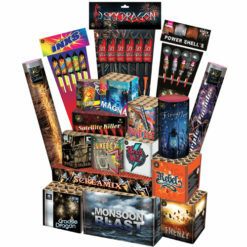 Category 1 or F1 Fireworks, are fireworks which are intended for use in confined areas, including fireworks which are intended for use inside domestic buildings (i.e. indoor fireworks). Category 2 or F2 Fireworks, are fireworks which are intended for outdoor use (i.e. 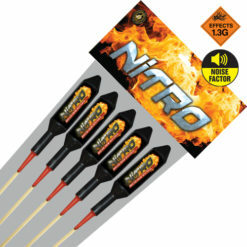 garden fireworks) and can have a minimum safety distance for operators of 8 metres, and spectators between 8 and 20 metres. Category 3 or F3 Fireworks, are fireworks, which are intended for outdoor use in large open areas (i.e. 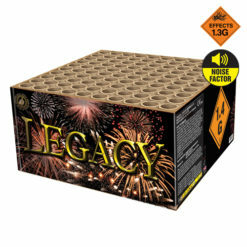 display fireworks for open areas such as fields) and can have a minimum safety distance of 15 metres for operators and 25 metres for spectators. Category 4 or F4 Fireworks, are not available to members of the public and are for use by persons with specialist knowledge (i.e. professional firework companies). What are 1.3G effect fireworks? 1.3g relates to the type, quantity or grade of explosive contained within fireworks in relation to their transport and storage. Generally 1.3g effect fireworks contain louder and bigger bursts but this is not always the case. 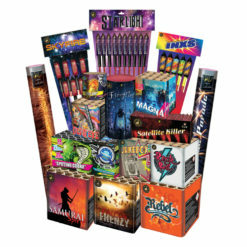 There are many varying factors which determine the classification a firework falls into including the type of packaging, the size, type and amount of its chemical components. All our fireworks are made by reputable manufacturers who use the highest quality chemical and powders to offer you the best effects and bursts irrespective of whether the product is 1.3g or 1.4g (of which most fireworks are categorised). In addition, by adding the unique metal pyromesh system to some of our fireworks we are able to offer you the 1.3g effect fireworks in a 1.4g version that we are able to transport on our carriers. When unpacking take care especially with fireworks enclosed in a pyromesh cage, wear sturdy gloves and use snips to remove metal banding and cage then follow instructions on the label. Further safety information can be found on our safety guide. For coupon codes please follow our Facebook page where codes will be updated. November 5th (Guy Fawkes Night) which is midnight. It is courtesy to notify neighbour if you are having a display so they can make arrangement for pets, young or the elderly.